There were 2193 Special Limited Edition "Feature" or "Summer Special" LX 5.0L convertibles produced in mid 1992. They were all painted Vibrant Red with a white interior and top combination. These cars had special rear decklid spoilers; color keyed side moldings, mirrors, door and window trim; and white wheels. The Superior Wheel Company in Kansas created these wheels for the Feature car by applying baked-on opal pearlescent paint over silver. The interior featured white leather seats with black piping, black carpet, an ebony dash, and a black Lori cloth headliner. The "Feature" option was an additional $850 over the base LX price. The VIN numbers of these cars were not sequential but started the same with 1FACP44E*NF (so far serial numbers we found are 156184 and 161282). Vibrant Red 1992 Mustang LX convertible owned by Richard Winters from Sun Valley, Nevada. This is a limited edition "Feature" car or "Summer Special. These cars had the exclusive Vibrant Red paint with special body colored mirrors, colored door top moldings, colored rear quarter panel moldings,and windshield trim. They also had rear decklid spoilers and special white 5-spoke wheels. It has a 5.0L engine and an automatic transmission. Richard tells us more, "My Brother got it factory made in 1992. He was a big wig at Sun Kiss and they gave him a personal vehicle so his Mustang was mostly parked in his garage. He moved to Las Vegas and had a stroke so I went and picked it up brought it back to my home. It has less then 68,000 miles on it. It is in excellent condition and gets great gas mileage. The only problem with it is the driver's door handle like most 92 Mustangs." Vibrant Red Limited Edition 5.0L "Feature" 1992 Mustang LX convertible. A quantity of 2193 "Feature Cars" were made in 1992. They were all Vibrant Red which is actually a 1993 color. Only the "Feature Cars" came in Vibrant Red. Unlike other 1992 Mustangs: they had body colored side mirrors, moldings on top of the doors and rear quarter panels, and windshield trim; rear decklid spoilers, white 5-spoke wheels. 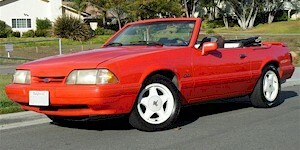 Vibrant Red Limited Edition 5.0L "Feature" 1992 Mustang LX convertible with color matched side mirrors, moldings on top of the doors and rear quarter panels, and windshield trim; rear decklid spoilers, white 5-spoke wheels, and a 5.0L V8 under the hood (the white pin striping and Limited logo was added). This car was photographed at the 2010 Mustang car show in Port Angeles, Washington.